Lineage. 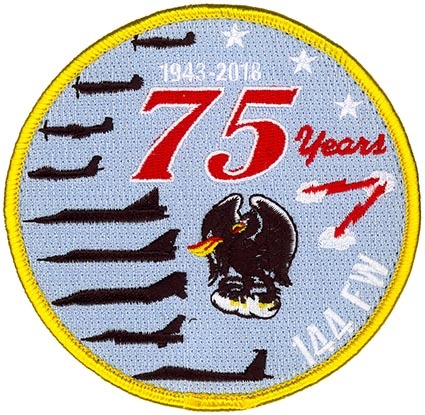 Constituted and extended federal recognition as 61st Fighter Wing on 4 Apr 1948. 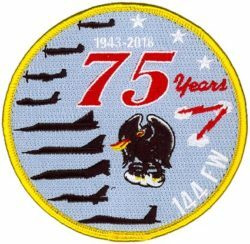 Redesignated: 144th Fighter Bomber Wing on 1 Nov, 1950; 144th Fighter Interceptor Wing, 7 Jul 1955; 144th Fighter Wing on 15 Mar 1992-. Assignments. Air Defense Command, 1960; Tactical Air Command, 1979; Air Combat Command, 1992-. Components. Squadrons. 194th Fighter (Fighter (SE); Fighter-Interceptor; Fighter-Bomber; Fighter-Interceptor; Fighter) 1948-. Stations. Oakland Airport, CA, 2 Jun 1948; Hayward Airport, 2 Mar 1949; Fresno Yosemite IAP, CA, (later Fresno ANG Base), 1 Nov 1954-. Aircraft. T-6, 1948-1949; B-26, 1948-1949; F-51-1949-1954; F-86, 1954-1964; F-102, 1964-1974; F-106, 1974-1983; F-4, 1984-1989; F-16, 1989-2013; F-15, 2013-. Operations. Air defense of the western USA, 1952-. Decorations. Air Force Outstanding Unit Award: 1967, 1973, 1978, 1988 & 1994.